Founded in 2003 as a finance and HR transformation consultancy with a focus on Higher Education, Public Sector, and Federal clients, Collaborative Solutions has consistently delivered value to our customers looking to adopt the latest technologies. Higher Education is a strategic priority of ours. We have worked with a variety of Higher Education institutions including Brown University, the University of Southern California, Grand Canyon University, and University of Chicago. 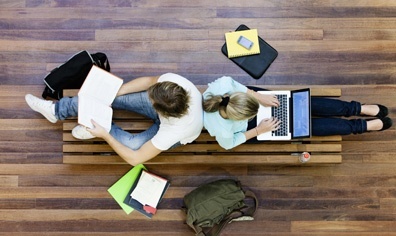 Our Higher Education capabilities have been developed to both current and future demand, including the expertise to support Workday's Student solutions. Our strong and committed presence in E&G continues, with a growing number of Education and Government Workday accounts and multiple dedicated Workday Education and Government Product Leads. 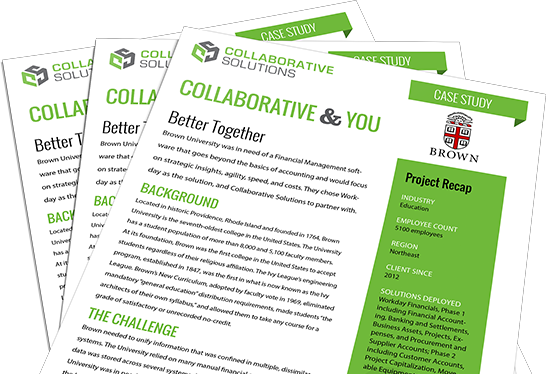 "Brown University is staffed with consultants from Collaborative Solutions on our Workday Financials project. They have been very, very knowledgeable about Workday and higher education, and are very dedicated and hard working. I recommend Collaborative Solutions for your Workday implementations in Higher Education." "Collaborative was referred to us by Workday. They stayed with us when other consulting companies did not. They were patient, creative problem solvers, and responsive to our overly complex needs." Brown University was in need of a Financial Management software that went beyond the basics of accounting and would focus on strategic insights and high-speed performance. They chose Workday as the solution, and partnered with Collaborative Solutions for deployment.